lol with the leightons: Fireworks No. 6!!!!!! If y’all haven’t figure it out by now, I’m a simple person. What you see is pretty much what you get. I don’t know a soul who would ever call me “fancy.” Now, TLC? Her Funny Hubby (HFH) will ask Little Leighton (LL): What is Mommy? LL will say: “Fancy.” It’s a joke he makes because TLC (1) likes nice things and (2) is pretty much a perfectionist. Oh, okay. She admits it: She’s OCD. About cleanliness. Organization. Etc. And "nice" things. TLC has a degree in Fashion Merchandising. It seems it would only follow that she adores lovely purses, shoes, clothes. Nordstrom is her most favourite store. Y’all know this. Does she shop there often? Especially since the birth of LL? Not as much as she’d like. She also treasures a great bargain/sale. Slightly expensive purses, shoes, and clothes? They go on her Wish List and sometimes…SOMETIMES…she receives one of them as a birthday or Christmas gift. Although we don’t always agree on clothes, we’re usually simpatico about shoes (hers—not mine—I could pretty much care less about owning lots o’ stunning shoes—comfort is my requirement...) purses and home furnishings. I’m proud to say she does have excellent taste. Must be her “Royal” heritage—wink. Wink. Target would be TLC’s next favourite store—actually, it could now be tied with Nordstrom. Third? Bath and Body Works. (My Sweet Hubby calls this store: Soap and More. He's a hoot.) Our daughter MUST have their soaps. For her inventory in her pantry. She requires backups for backups. Naturally, she only buys them when B&BW is running their specials: 5 bottles for $15. Something like that. She stocks up. Then there’s Her Mama—Moi—ELC. Never one to want to pay a lot for anything—cars, clothes, trips, makeup, shoes, purses, furniture, etc., I’m content with washing my face each night with Dove or Safeguard (Safeguard in the Summer—when my skin is oily/sweaty/icky—sorry for that mental picture. Please be assured I went to a wonderful dermatologist for years that approved of these cleansers—cross my heart.). I buy my face creams from the drug store. Then decide they’re too much trouble to actually apply to my face and (turkey) neck—especially when I’m beyond pooped at night. Hand soap? At my kitchen and/or bathroom sinks? I’m good with dishwashing soap and the said Dove and Safeguard. To sum up: I’m frugal (or cheap, if you prefer) and mostly unconcerned about the general appearance of my hands and face that are both full of wrinkles/dry skin/brown spots/sagginess. HOWEVER…TLC convinced me—many years ago—to have “nice” hand soap dispensers in all bathrooms and at the kitchen sink—when we have “Company.” She purchases these for me when she’s picking hers up. Thank you, TLC. Thank you very much, Sweet Pea. Off and on, over the course of my life, I’ve also received some lovely “pump” soaps as gifts. About four years ago, at Thanksgiving, one of our daughters-in-law brought me some Williams-Sonoma “Winter Forest.” I immediately began a routine of pulling it out from under the cabinet in our guest room bath and generously sharing it with all from November through the end of February. This past November? I decided I was worth using Winter Forest at my bathroom sink. I used it often. And, yet, look at what’s left! A month ago, I was still using it when I decided I deserved to have a more Summer-y soap. One recent afternoon, while MSH and I were roaming around Ft. Worth—doing lots o’ errands—and while I was exchanging some capris I’d ordered from Talbot’s—I sent MSH over to the Williams-Sonoma store (which he loves to visit—seriously loves...) to check out the soaps they had that would be more seasonal appropriate. Within a few minutes, I had a text from him with a picture of the Rosemary Mint bottle of soap. He said it was $12. YIPPEE! Higher than B&BW, yes. But I know this bottle will last me for a year or two—maybe more. Then MSH inquired if I would want the “free” plastic pump or a prettier one that was $3. Uh, was he kidding? You can guess (and see) what my answer was, right? 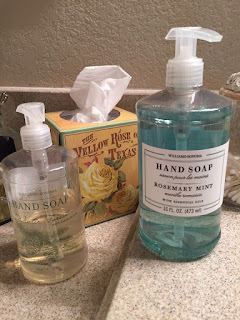 Now I’m not only a fan of Bath and Body Works’ soaps, but also of Williams-Sonoma soaps. They have “essential oils,” don’tchaknow. Essential oils are all the rage around these here parts. I feel certain I could wash my hands every 20 minutes, all day long, and they’d be soft. Combining this soap with my “Working Hands” cream? That’s what I’m talkin’ about, Dearest Darlings! Be fancy! Be wise! If you’ve never tried a bottle of Williams-Sonoma soap? Do it. I’m confident you’ll be pleased.